The monster home improvement store may have no better luck in this new location. Watching over the area and poised for intervention is the Bernal Heights Neighborhood Center, already heady with success in the creation of affordable housing/community services at the intersection of Mission and Cesar Chavez. The fat lady’s singing. According to an April 6 article in the San Francisco Business Times entitled “Mid-Market turns to skid market,” it’s all over: “If rents have tumbled in the Financial District and plummeted in the heart of South of Market, they are virtually in free fall in the Class B and C buildings in further-flung traditional industrial areas like Mid-Market and far South of Market.” Adds author Amanda Bishop, likely tenants in these areas are now not dot.coms but — I kid you not! — non-profits. 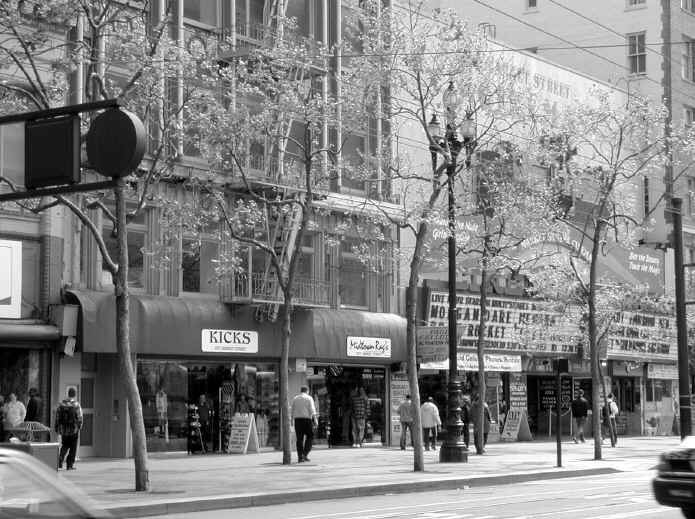 At present, the dignified green façade of 1047 Market nestles cheek-to-jowl with the bright red marquee of the Market Street Cinema next door, in what seems a fitting recapitulation of San Francisco’s past. Better a bustling bawdy neighbor than empty elegance. Singing the corporation blues. Has anyone connected the dots between this weekend’s FTAA protests in Quebec and public opposition to the San Francisco’s proposed tax settlement? Observers in Canada worry that the American heads of state meeting there are giving away the civic store to large corporations. People closer to home, who have feared a similar fate for their city for several years, must see the tax payout as a sellout, an incontrovertible symbol that the deal has already been done.